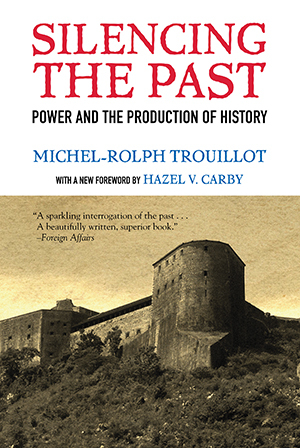 Michel-Rolph Trouillot places the West’s failure to acknowledge the most successful slave revolt in history, the Haitian Revolution, alongside denials of the Holocaust and the debate over the Alamo and Christopher Columbus in this moving and thought-provoking meditation on how power operates in the making and recording of history. Silencing the Past analyzes the silences in our historical narratives, what is left out and what is recorded, what is remembered and what is forgotten, and what these silences reveal about inequalities of power. Weaving personal recollections from his lifetime as a student and teacher of history, Trouillot exposes forces less visible—but no less powerful—than gunfire, property, and political crusades. This twentieth-anniversary edition of Trouillot’s pioneering work features a new foreword from renowned scholar Hazel V. Carby that speaks to the continuing influence of Silencing the Past on the fields of anthropology, history, and African American, Caribbean, and postcolonial studies—as well as to the book’s unique pedagogical value as an introduction to historical analysis.